The days of ad-free social networks are long gone, and today Pinterest and Instagram both announced initiatives that may be good for users but even better for businesses and advertisers. To be sure, Pinterest's new move isn't necessarily ad-driven, but rather looks to make purchasing a more streamlined endeavor. As for Instagram, it's opening advertising to businesses of every shape and size ... and using info from Facebook to help them better target users. DIYers and businesses alike have embraced Pinterest, the $11 billion virtual pinboard, as a hub to decoratively display their products and innovations. To capitalize on people's interest in the products they see on Pinterest, the network is adding "buy-it pins" for purchases in its mobile app. The buy pin (essentially a buy button) will appear beside the traditional "pin it" button. Users will then be given the option to choose a payment method, and with one more click, their latest purchase is headed to their homes. Right out of the gate, 2 million items will be available for purchase, including goods from Macy's and Nordstrom, purchasable with a credit card or Apple Pay. Perhaps we'll see Android Pay supported added in the future? You can expect to see "buy-it pins" on the iPad and iPhone Pinterest apps by the end of June, and there's no word yet on when the feature will come to Android pinners. Instagram has announced it's opening the advertising floodgates, similar to the way its parent company, Facebook, has done for years. Instagrammers will note that ads have been gradually appearing on their feed for about a year and a half, but the photography-focused network wants to make it easier for businesses to convert followers into customers. Instagram is also testing a way for purchases and downloads to be made by clicking on links in posts themselves, rather than the old method of posting a link in the description box, often skimmed over by the target audience. These "direct response ads" are meant to take down the barrier between business and consumer. Finally, but perhaps most importantly, Instragram plans to help advertisers reach their desired audiences by using demographic and interests information picked up from users' Facebook activities. 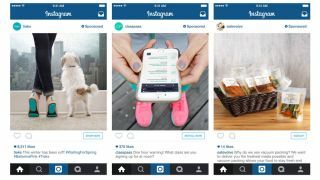 That's right: more targeted ads are coming to Instagram, thanks to what you liked over on FB. Instagram will also let businesses use info they already have about their customers, just as Facebook currently allows for its ads. Advertisers will essentially be able to run the same ad campaigns on Instagram and Facebook targeted at the same users, according to Ad Age. These particular advertiser services won't roll out until later this year. Facebook, which purchased Instagram in 2012, announced in July 2014 that it would begin experimenting with its own "buy button" to "help drive sales through Facebook in News Feed and on Pages." Not to be outdone by Facebook, Google chief business officer Omid Kordestani confirmed last week that Google would launch a buy button to appear on shopping advertisements at the top of the page. Google also plans to make the purchases happen in-house, rather than routing the buyer to another website. No matter how relevant or unobtrusive, ads are still ads to some users, and they, along with in-service buy buttons, are becoming commonplace.